Hashimoto’s encephalopathy (HE), also termed as steroid responsive encephalopathy associated with autoimmune thyroiditis, is a rare and highly variable clinical spectrum. The clinical presentation includes seizures, stroke-like episodes, cognitive decline, neuropsychiatric symptoms, and myoclonus.1 We report a rare and unusual case of HE in which there was a partial response to steroid therapy. A 76-year-old man was admitted to the Department of Neurology of the Near East University Hospital, Cyprus, in October 2016 with the chief complaint of myoclonic jerks and walking difficulty for the past 6 weeks. The patient’s family had observed no significant cognitive or behavioural change. He did not experience any seizure. His medical history included hypertension and diabetes. On neurological examination he was alert and fully oriented. Motor weakness was noted at the left lower extremity with Babinski sign. He had myoclonus in all limbs and bilateral postural tremor, which was predominantly left sided. Magnetic resonance imaging (MRI) scan of the brain revealed widespread T2 hyperintensities mainly in the juxtacortical areas (Fig 1). Blood studies including complete blood count and electrolyte count; liver, renal and thyroid function tests; tumour markers; and paraneoplastic antibody analysis (anti-Hu, -Yo, -Ri, -Ma, -CV2) were all normal. Vasculitis markers including antinuclear antibodies, anti-ds DNA, anticardiolipin immunoglobulin (Ig) M, IgG antibodies, antiphosphatidylserine IgM, IgG antibodies, perinuclear antineutrophil cytoplasmic antibodies, cytoplasmic antineutrophil cytoplasmic antibodies, anti-La and anti-Ro antibodies, and rheumatoid factor were within normal limits. He tested negative for human immunodeficiency virus. His cognitive status worsened during his first week of hospitalisation and he rapidly developed delusions and aggressive behaviour. He was not able to cooperate with the neurocognitive assessment. 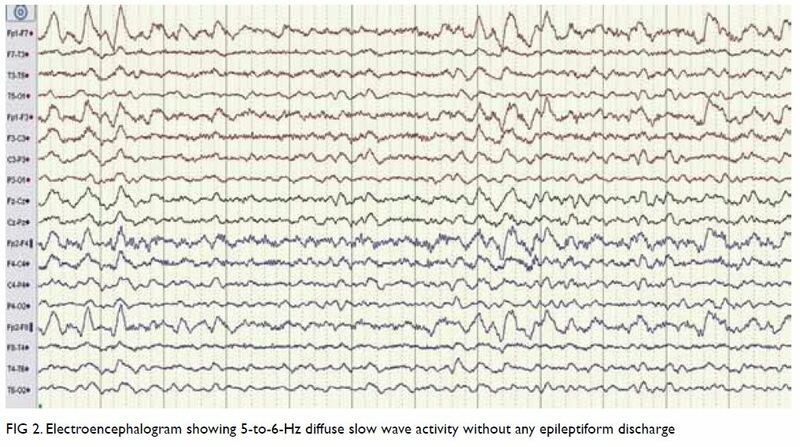 Electroencephalogram showed 5 to 6 Hz diffuse slow-wave activity without any epileptiform discharge (Fig 2). Cerebrospinal fluid (CSF) analysis showed a very high protein content (1.95 g/L). The CSF/serum glucose ratio was normal. Cerebrospinal fluid investigation and culture was negative, excluding central nervous system infection. Whole-body positron emission tomography was performed to exclude paraneoplastic processes and the result was normal. Consequently, steroid-responsive encephalopathy and associated autoimmune thyroiditis was suspected, and antithyroglobulin antibody (anti-TG-Ab) and antithyroperoxidase antibody (anti-TPO-Ab) levels were studied. Serum level of both was increased (431 IU/mL and 40 IU/mL respectively). He was not taking any medication (eg, lithium, amiodarone, etc) that could account for the positivity of thyroid antibodies. Thyroid ultrasonography did not show any pathological findings. Intravenous pulse steroid treatment (IVPS, methylprednisolone 1 g/day) was started. Myoclonus resolved on the fourth day of treatment. Because the cognitive status of the patient was not adequately changed, IVPS was extended to 10 days. A partial response was obtained in cognition and Mini-Mental State Examination score was 11/30 after IVPS. Another electroencephalogram showed mild improvement. Consequently, oral methylprednisolone was continued at a dosage of 1 mg/kg/day. Afterwards, intravenous Ig treatment was given at a dose of 0.4 g/kg for 5 days. No additional improvement was seen. Lumbar puncture and thyroid autoantibody testing were repeated. The anti-TPO-Ab and anti-TG-Ab levels were normalised, and CSF was acellular at that time and protein content decreased (1.45 g/L). Azathioprine 100 mg/day was gradually added to his treatment. The patient was discharged from the hospital with oral steroid and azathioprine treatment. His neurological status was stable. He died 3 months later due to a lung infection. The clinical findings, CSF analysis, and MRI of our patient were compatible with HE. The challenging conditions we faced were the lack of prominent cognitive or psychiatric change at the beginning and normal thyroid functions. The differential diagnosis included vasculitis, paraneoplastic limbic encephalitis, and Creutzfeldt-Jakob disease (CJD). The MRI was very helpful for differential diagnosis. The pattern of isolated cortical hyperintensity with concomitant combined cortical and deep grey matter (basal ganglia) hyperintensity on fluid attenuation inversion recovery along with restricted diffusion can differentiate CJD from other rapidly progressive dementias with a high sensitivity and specificity.2 Because the consecutive diffusion-weighted images of the patient were not compatible with CJD, 14-3-3 assay in the CSF was not studied. In addition, it is not specific for CJD and its positivity is also reported in HE.3 The laboratory and imaging findings were not compatible with limbic encephalitis. We assessed his objective clinical recovery (dramatic disappearance of myoclonus and partial cognitive-behavioural improvement) following pulse steroid therapy. Response to treatment may also exclude the diagnosis of CJD. The pathophysiology of HE is not well understood. Autoimmune cerebral vasculitis and antibody-mediated neuronal reaction are the most accepted mechanisms. Most patients are euthyroid at the time of diagnosis.4 Antithyroperoxidase antibody is known as a positive predictor of responsiveness to steroid therapy and higher titres are associated with a more favourable outcome.5 Most cases in the literature treated with steroids make a complete recovery.5 Since it is a rare condition, the optimum treatment for steroid-resistant cases is unknown. Response to intravenous Ig or plasmapheresis treatments in steroid non-responsive cases has also been reported.5 Despite the normalisation of anti-TPO-Ab and anti-TG-Ab levels and somewhat improved inflammatory findings of CSF after treatment, we observed a complete response in myoclonus and only a partial improvement in cognition in our patient. This supports the hypothesis that thyroid autoantibodies are not the only pathogenic mechanism in HE. Other causes, the role of the thyroid gland, and other antibodies should be clarified by future studies. Concept or design: B Kaymakamzade, S Ertugrul Mut. Acquisition of data: H Özkayalar, A Eker, S Ertugrul Mut. Analysis or interpretation of data: B Kaymakamzade. Critical revision for important intellectual content: S Ertugrul Mut, B Kaymakamzade. We thank Dr Mustafa Canatan and Dr Fehim Türktan for their contribution to the editing of the manuscript. This study was conducted in accordance with the principles outlined in the Declaration of Helsinki. The patient provided written informed consent.